I went out for an hour yesterday, after dealing with a sick child. Once he was feeling better and was watching t.v. I excused myself for a bit of gold hunting. I returned to one of three spots that I am methodically clearing of all mid-tones. At one point, I got what I believed to be a deep target signal. It was a consistent high chirp from all directions. I cut a deep plug and stuck the pinpointer in the hole but got no signal. When I laid the pinpointer down to deepen the hole, the pinpointer sat about 12 inches away from the hole and it went off big. I thought I would remove whatever was making the pinpointer go off before I continued looking for my deep target. The target that was setting the pinpointer off was a large mass of iron just a couple of inches below the surface. So before I returned to digging the deep target out, I stood up and re-swiped the hole just to be sure I wasn’t off on my pinpointing. There was no signal in the hole anymore so I scanned the plug and bang! a solid, no-doubt-about-it pull tab signal came loudly through the backphones. What!? Curious, I put the plug back in the hole and scanned it from the top. Sure enough, the loud pull tab signal was there. Why didn’t I get this loud signal before? I dug the pull tab out with the Lesche and it turned out to be just 3 inches deep. I swear that I scanned this signal from all sides! And before I removed the large iron object the pull tab sounded faint and high like the kind of signal that I dig all the time and that usually produces a deep target. After thinking about it, I decided that the large iron target, TWELVE inches away, was masking this pull tab. I was using my 11 inch coil, which has a large footprint. An obvious solution to this is to use a sniper coil, thus minimizing the effects of the masking in this case. So yes, a smaller coil would have dealt with this problem but it wouldn’t eliminate THE problem, which is masking. 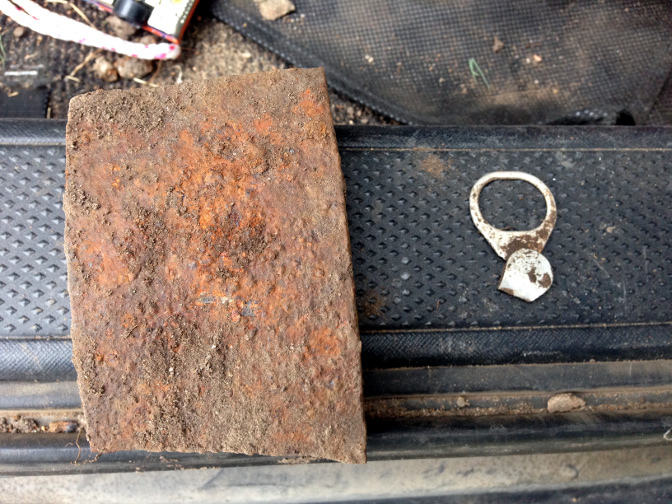 The rusted iron is about 2 inches thick. The ring was about 5 inches deep and gave a nice and clear beep. I was discriminating anything below nickel. 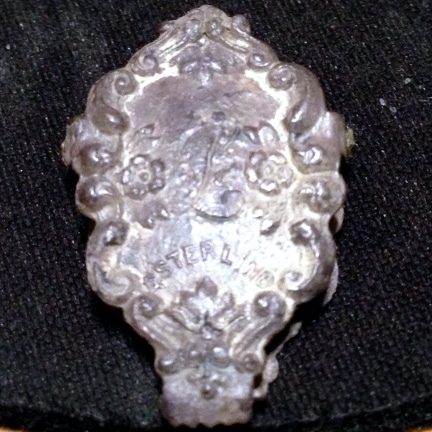 The ring is obviously silver although no maker’s mark is present. It is well worn and the style says vintage. The picture doesn’t do it justice. 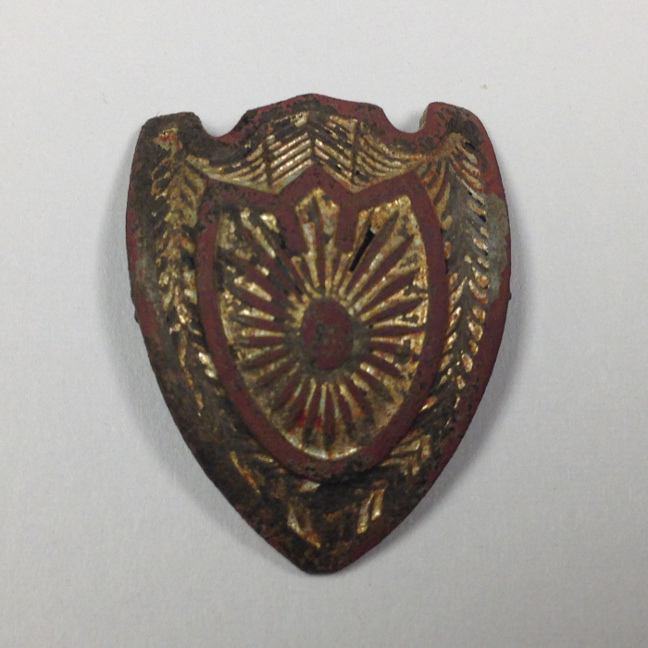 Once I got to my office and cleaned it well, I could tell there was absolutely no corrosion. 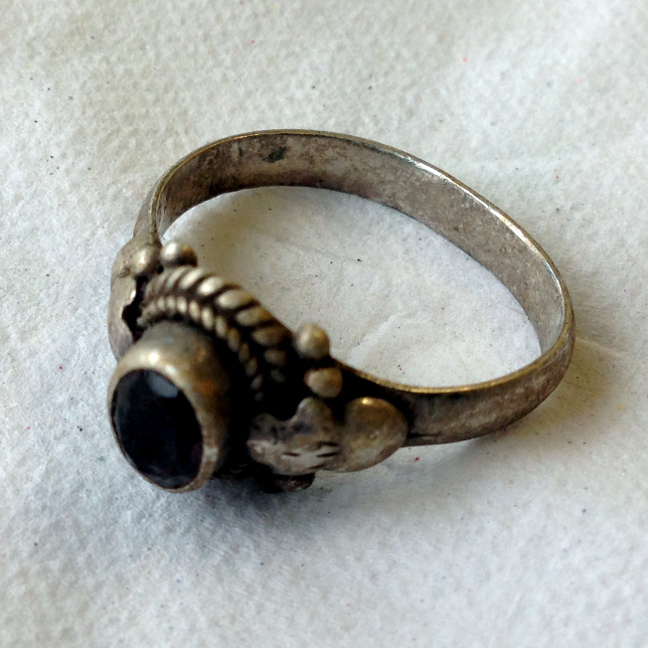 The silver looks old and the stone looks to be a garnet. 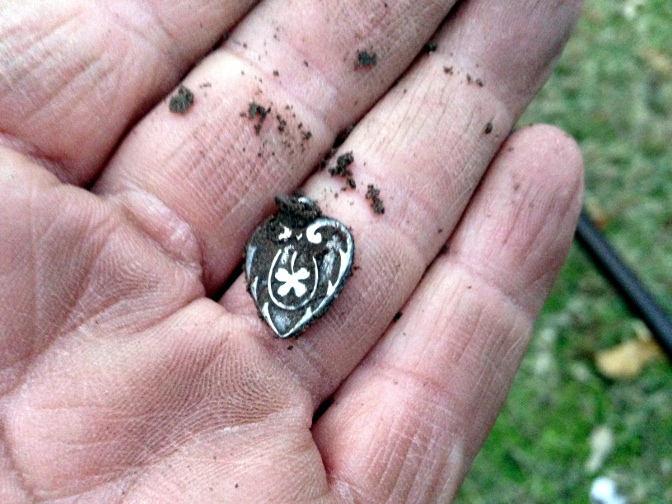 I will test it with the acid once I get home but I am confident this is very old silver. After a 1977 nickel and a few more pull tabs I decided to go get some food. I’ve decided to continue my gold hunting with the Compadre. I know it won’t let me down. I can’t believe it’s been so long since my last post! I am back in the game though. I’ve managed three hunts in as many days. For my return to my beloved hobby, me and Maurice are looking for gold. Now, I’ve heard tales and I’ve heard fables about people who can tell gold by the type of signal they get. Not to call anyone a liar but I am highly skeptical of this. I remember ONCE, with the AT Pro, getting a nickel signal that was silky and full and all kinds of groovy and finding a pendant in the hole when I dug the signal. That was it however. Not before and not since have I gotten a signal like that on a mid tone. Even the gold rings I have found sounded like a plain old mid tone signal. So, this means I am digging every signal between high foil and pull tab. It’s unforgiving work let me tell you. So far, I estimate a total of 180 pull tabs, and about half that number in aluminum foil. Out of all that I have found a Wichita Transportation token from the 60’s and a pretty metal button. Brutal. Oh, and I am digging every bottle cap as well. I have dug about 100 bottle caps so far in these three hunts. The reason for digging the bottle caps is that when I look for gold, I don’t meander around but rather, I pick a spot and work every signal there. It keeps me from losing my mind because as I am looking for gold, I am also cleaning a spot for future deep-signal hunting. To this end, I am selective about the spots I choose. A) They have to be target rich. That tells me that there was heavy human activity in the past. B) They have to be spots that are no longer popular, thus ensuring all targets are old-ish. 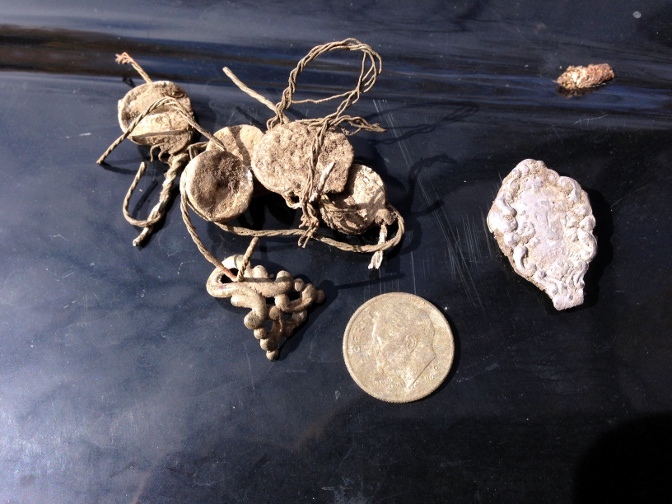 Hunts like these make me wish I had started metal detecting in my 20’s. Right now, I can do this non-stop for about three hours. After that, my attention wanes and all I want is a sandwich and a drink. Once I stop, I am useless as my body stiffens and all I am good for is sitting and watching tv. I intend to keep on going until I score a ring, or a chain or some other gold item. Stay tuned for updates. I went out with my XP Deus metal detector the other day looking for cool stuff. As usual, I hit one of our city parks. Most of our city parks are hunted regularly so I am not surprised when I don’t find a lot of clad –or any clad, there. This time however, I found a few dimes, a bunch of nickels, and even a quarter. The clad was surprising but the nickels were not. Finding nickels with the Deus is child’s play. 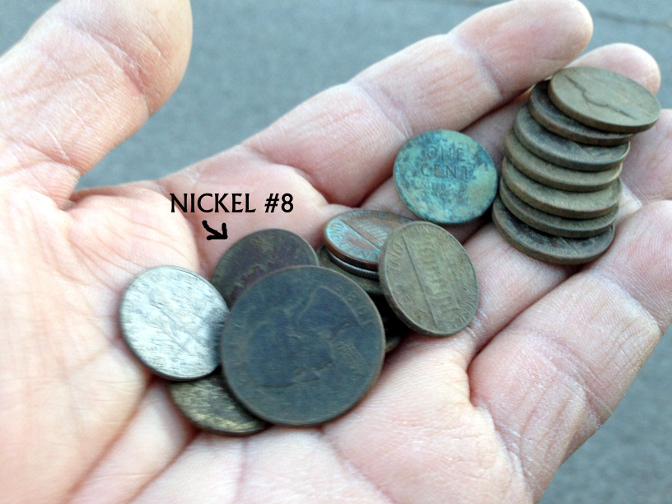 And since it seems that no one else digs nickel signals, there are always many left in any of our city parks. The mystery to me is that with as many nickels as I dig, and 7 to 8 nickels a hunt is not unusual, why am I not finding lots of gold? I guess that speaks volumes about the volume of gold in our parks; that is, there is not much. Still, I will continue to dig nickel signals because Maurice makes it easy. 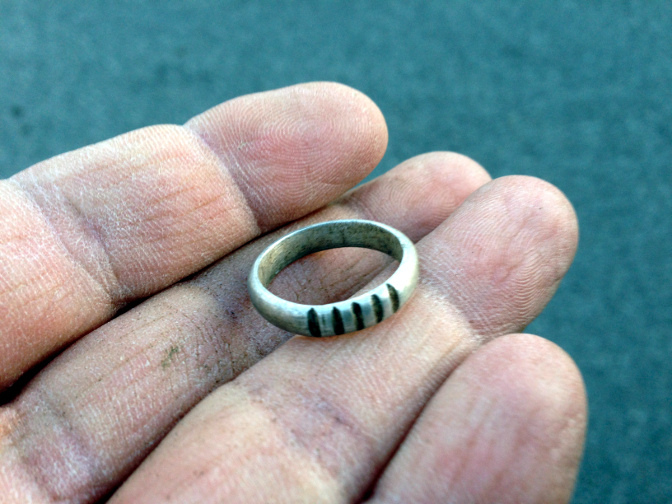 Oh, and I found my first silver ring of the year. About 6 inches down and gave a strong quarter signal. I’ll take it. Because of the increased level of stress at my job this time of year, I find it necessary to resume my lunch hour hunts to clear my head. So much for the walking! LOL! I returned to the spot I found yesterday at the city’s oldest park. Maurice immediately found me some very deep, very old pieces of metal, mostly lids from bell jars and other assorted stuff. I dug a number of lead seals from all over the area. I can’t imagine what they went to. Eventually I stopped digging that signal but I may at one point dig all of them up. My findings convinced me that I am right and that the spot is the oldest undisturbed piece of the park. Before I left, I got a deep signal. With the 11″ coil, the deep signals are much louder and sometimes I even get an accurate VDI. This signal was louder than the old whispers I used to get with the 9″ coil and the VDI was that of a wheat or an Indian. So I dug up my usual 7 inch deep plug and at the bottom I got a dim hit with the Garrett pinpointer. Another inch of dirt out and I saw the clump of metal at the bottom. Once I cleaned it a little I thought I could read the word sterling on it but I wasn’t sure. Plus, the word was on the front and not on the back as one would expect. Once I got home I cleaned it and sure enough, it says sterling. I place this piece at the turn of the century and now I know I can hit smallish silver at 8 inches with no problem and with a good, discernible tone. The Seated coin is still in the ground; for now. 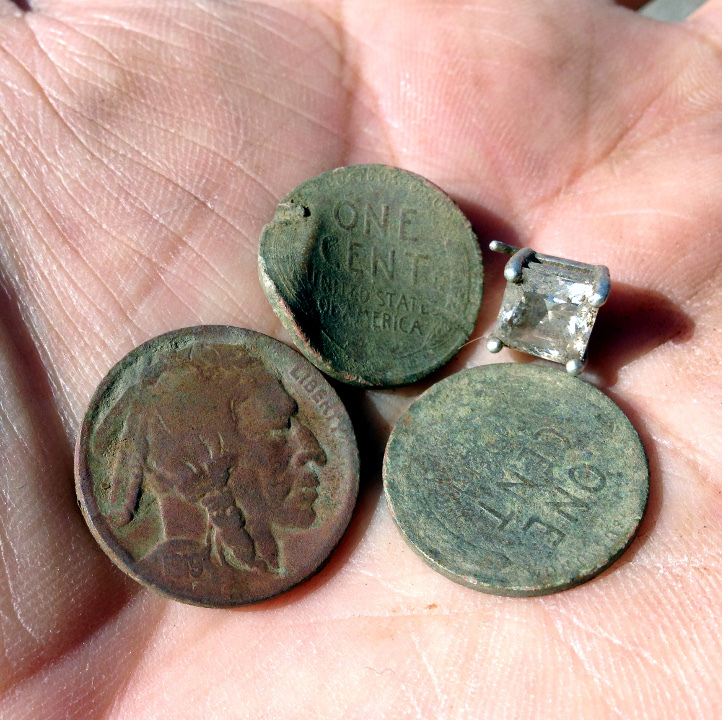 I was talking with Steveouke yesterday about how some old coins in the ground don’t sound like coins at all when you run your metal detector’s coil over them. This is particularly important to me since I am still looking for my first Seated coin. 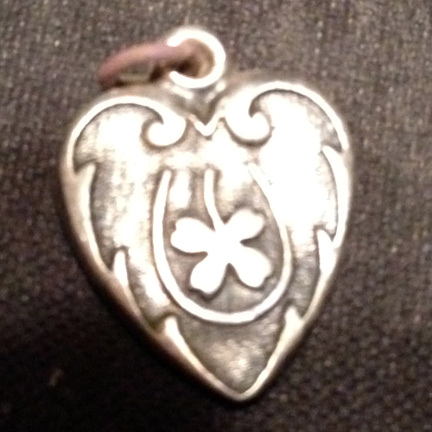 This tiny pendant is marked “Sterling” on the back. If I only dug high tones with coin VDI’s I would have left this in the ground. Let me remind you that three cent coins would also ring somewhere around this range. I am not saying you should dig every beep but you may want to broaden your digging criteria if you only dig coin signals. Yep, that’s my first gold ring of the year. I was beginning to think that I was going to go the whole year without finding a gold ring. Phew! 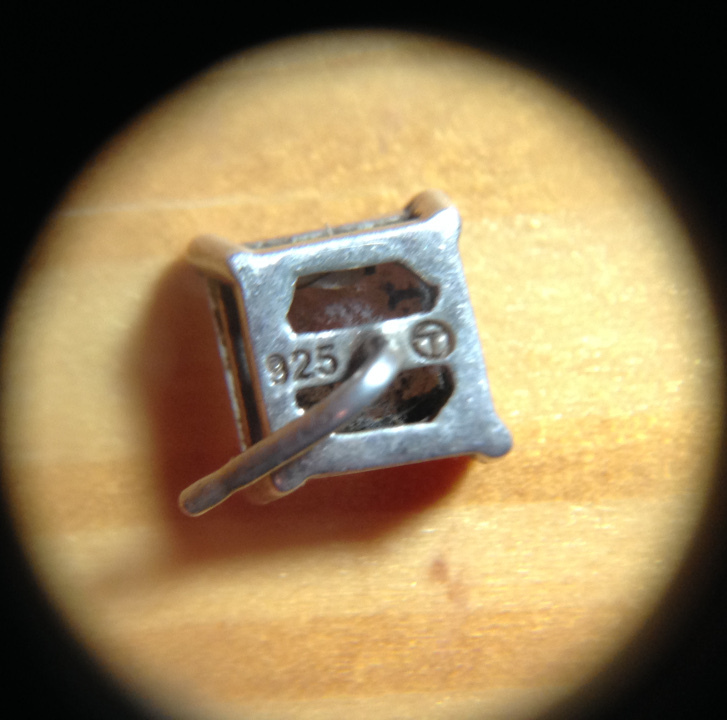 This signet ring is 10K and as soon as I can discern the maker’s mark (it looks like a B and an O with the 10K wedged sideways between the two letters) I will have a more accurate idea of its age. 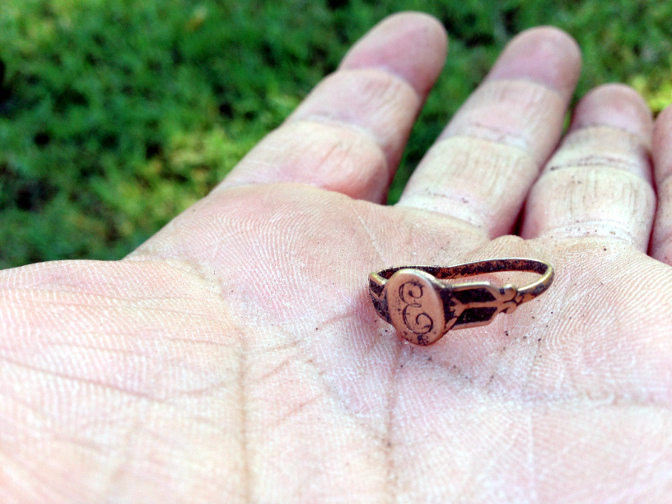 I can safely say that it is not a modern ring though, given the park and the depth at which I found it. Plus the style just says vintage. I think I will have it reshaped and polished.